20th Century Art History was probably one of my most favorite courses my last semester at UCF. I have quite the soft spot for modern art–modern, in the art world, described as anything from roughly the late 19th century to the late 20th century. I realize that’s not a terribly exclusive time frame, but if you’ve studied art, it’s almost hard to be such. 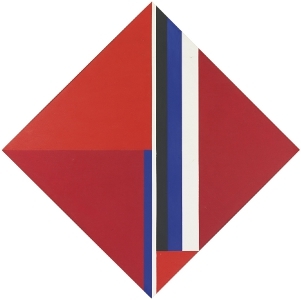 De Stijl (Dutch for “The Style,” or otherwise referred to as Neoplasticism) is, by far, one of my favorite movements. Led by Theo van Doesberg in 1917 Amsterdam, this movement was all about clean lines and simplicity. 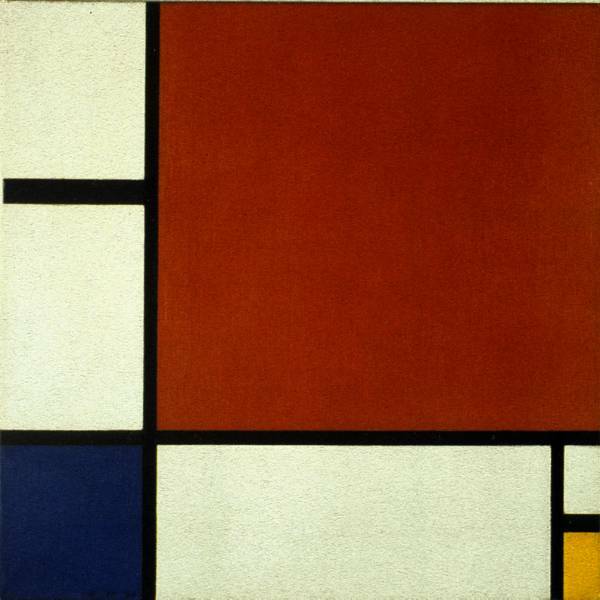 van Doesberg wrote the manifesto, stating the movement’s call for a universal aesthetic. It hints at constructivism and leaves no evidence of the artist in the work–no brushstrokes, no open canvas, nothing, even when given the fact that this art didn’t pop up out of thin air. It is graphic in its simplicity, with no narrative or emotional content, using only red, yellow, blue, gray, white, and black. Perhaps the most iconic example of De Stijl is seen in the Dutch artist Piet Mondrian (1872-1944). However, his painting career didn’t start that way. His earliest works were greatly influenced by the Luminist and Post-Impressionist movements, but he also experimented with Pointillism and bright, Fauvist colors and techniques. 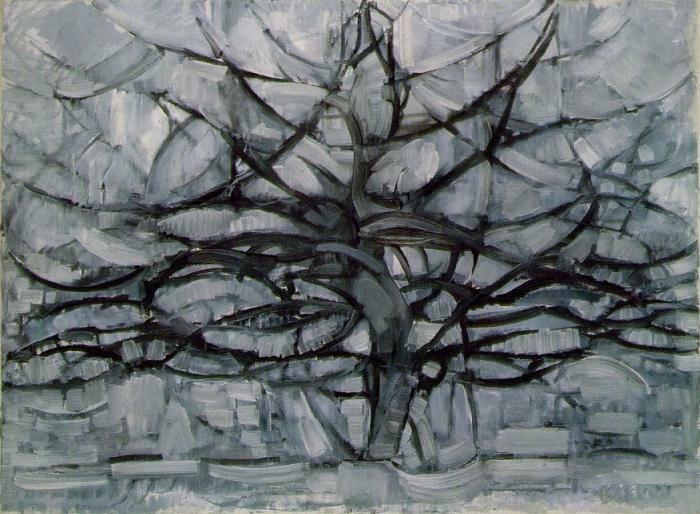 In 1911, Mondrian moved to Paris, where his art began to tend more toward Cubism (see Gray Tree, 1911). 1914 saw Mondrian on a visit home to The Netherlands–and the beginning of World War I. Unable to return to Paris, he stayed at the Laren artist’s colony. Here is where he met Theo van Doesberg and co-founded the movement we know as De Stijl. and, later on, Broadway Boogie-Woogie (1942-43). 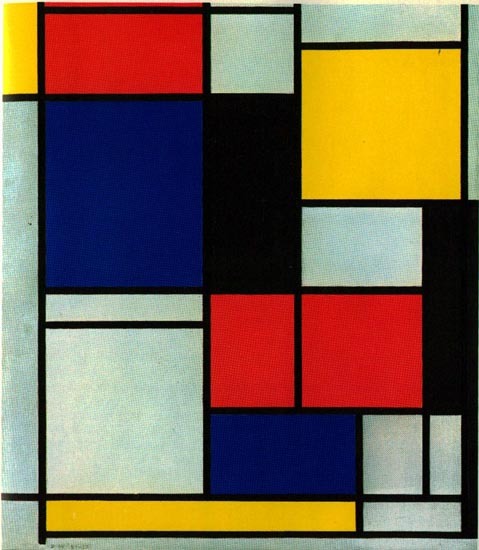 I haven’t really been able to find many who don’t at least respect Mondrian’s graphic style. Then again, I haven’t really spent much time outside of the Visual Arts Building at UCF (Room 111, all day, every day). This is the most memorable and essential figure of this movement. 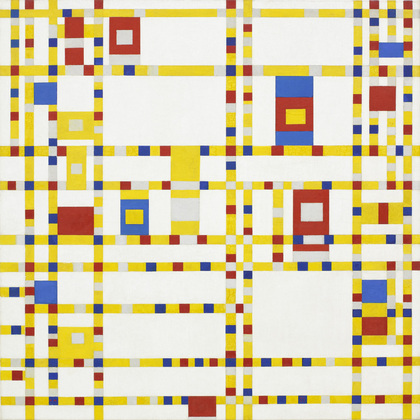 True to the manifesto, Mondrian leaves no traces of himself in his work, other than the fact that he created it. Though the closest I’ve ever gotten to these works are lecture slides (and on 9” x 9” printout of Broadway Boogie-Woogie on your’s truly’s mortarboard), there are no brush strokes. The works of other artists usually betray their mediums of choice-especially when you get into Monet, Turner, Whistler and others like them. De Stijl sought to eliminate all of this. Every inch of this canvas was covered. Every line was crisp and razor-sharp. Colors were bold, whites were stark, blacks were sharp, and the entire effect grabbed your attention because it was so damn different from the marble statues and Van Goghs that one will usually associate with the word “art.” This is not just a few lines and colored blocks on canvas. These works inspired architecture and even furniture, à la Gerrit Reitveld. De Stijl was a way of life. Piet Mondrian’s artistic tradition would go on to influence Russian artist Ilya Bolotowsky. His Vertical Diamond (no date found), as you might remember, was bought in 2012 from a Goodwill in North Carolina for $9.99. It later sold at auction for $34,375. UCF is lucky enough to own a few of Bolotowsky’s prints. We continue to talk about different artists for different reasons. For instance, Duchamp makes me angry. Vehemently angry. An art history teacher of mine once described Fragonard as the artistic equivalent of Coke Zero–likable and satisfying, but not much substance. Once and for all, WHY WAS MONA LISA SMILING? Mondrian is simple and straightforward.